Now out in audio as well as paperback and e-book! Kings River Life writes: “This third in the Food Lovers’ Village Mystery series advances plots established in the début and follows characters finding preconceptions about their lives suddenly challenged. In additional to the descriptions of food and recipes, Budewitz also crams the novel full of movie lore, art appreciation, and the complexities surrounding the study and protection of wolves. The Billings Outpost writes: “The character development is top notch, and Erin is a truly likable heroine. Meanwhile, supporting characters such as Erin’s mother, nephew and pet cats provide solid comic relief. A blond teenager in gray leggings and purple running shoes, hair in a ponytail, stood at the open door to the Playhouse control room, her fleece-clad back to me. “Later,” came the reply. Older, male, firm. “Now,” she demanded, and I recognized Zayda George—high school senior, track star, president of the student Film Club. “Coming through,” I called, and wriggled my way out the door and into the wide passage leading to the lobby, both hands gripping the six-foot ladder. In the shadows, Zayda froze. I didn’t need bright lights to know she’d been pleading with Larry Abrams. Half a dozen kids from the Film Club who were running the projectors, lights, and sound for the weekend mingled in the Playhouse lobby. Christine Vandeberg pointed to a spot on the tile floor and I set up the ladder. She whipped a plastic bag off a five-foot-long hand-painted sign leaning against the wall. “Like it?” Christine clasped her hands, squeezing her fingers as she waited for my opinion. 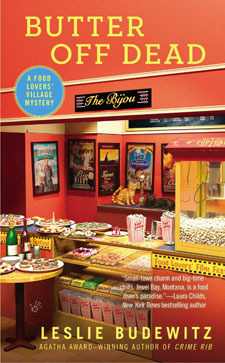 “Perfect.” For our first Food Lovers’ Film Festival, we’d rechristened the Playhouse in Jewel Bay, Montana, taking it back to its roots. You can’t go back again, not really. Times change. The places you love change. You change. But the right sign can transport you anywhere. “Perfect,” I repeated. “Like an old-time theater marquee.” Flamingo pink stripes emulating neon tubes ran across the top and bottom. On each end, faux diamonds, rubies, emeralds, and sapphires sparkled. And in the center, three-dimensional gold script read the bijou. Literally, the jewel. Figuratively, the Jewel Box. The longtime Hollywood lighting director forced a helpful expression. In his post-retirement volunteer work, he enjoyed being in charge. I could relate. But this Festival was Christine’s baby, and to tell the truth, being the gofer made for a welcome break. Larry steadied the ladder and Christine clambered up the rungs. I handed her the chain attached to the sign. She slipped the top link over a hook barely visible in the shiny tin ceiling and climbed back down. As I juggled the weight of the sign and Larry scooted the ladder over, I caught sight of Zayda a few feet away, one arm folded across her torso, absently biting the tip of her little finger. “Um, it’s good. Sparkly.” Her voice lacked its usual zip, and she blinked rapidly as she glanced at Larry. His own eyes lit on her briefly before refocusing on the sign. “Seriously, old man. You kept the posters from when you were a kid?” Zayda’s boyfriend, Dylan, , ran a hand through his dark blond hair. I’d spent enough time with the kids to realize that while she adored the movies, it was the technology that fired him up. “’Cause she always wins,” the redhead said. “Yeah, but buying stuff just to hang on to it . . .” Dana’s voice trailed off. Clearly, he was not in possession of the collector gene. “Enough jabbering. Gotta make sure all this new gear runs like it’s supposed to.” Larry pointed toward the control room. “Yessir.” Dylan gave a mock salute, and the kids swarmed out of the lobby. Zayda trailed behind. “Larry, you promised . . .” she said in a low voice. “Soon as the job is finished,” he said. Zayda bit her lower lip and followed the other kids. Larry headed for the men’s room. “What was that all about?” I asked Christine. Face raised, her gaze darted from one end of the sign to the other, measuring whether it hung straight and level. Years as a professional framer gave her a sharp eye for details. The sign sparkled. Which was the point: To bring a little color and light to a village mired in the deep midwinter. Let other towns break the monotony of February with hearts and flowers. But a town that calls itself the Food Lovers’ Village and boasts first-class summer stock plus a vibrant community theater? Food and film, a natural combination. I reached for the ladder. “No. But Larry may be a little too directorial.” Zayda was a good kid, eager to prove herself. Eager, too, to get on a pro’s good side and make contacts in the industry. Her mother, Mimi, had told me she had her heart set on film school in L.A. She’d work lights and sound, almost any job, biding time for a chance to get behind the camera. Let other girls crave the spotlight. Zayda George wanted to be the one telling them what to do. “Your sister figured out some kind of insurance thing, so he finally agreed.” She scooped up the bag from the sign. “Speaking of collections,” I said. “Have you decided what to do with Iggy’s? I still can’t believe she had all that amazing art.” Iggy Ring, painter, collector, teacher, mentor, and a fixture in Jewel Bay, had died over the past winter. A tiny woman who’d left a huge hole in the community, and in my heart. “Good work, ladies.” Larry crossed the lobby to join the kids. “Thanks,” I called to Larry. To Christine, “good choice.” More than a century ago, settlers began floating logs cut from the surrounding mountains down the Jewel River to a mill beside the bay. Around 1900, construction of a small dam and power plant, and a new road for lumber wagons and trucks, spurred more growth. By the 1970s, the mill had closed, lights had dimmed, and town needed a new spark. Locals—including Old Ned Redaway and my family—fashioned Jewel Bay into an arts village, and in recent years, cooked up a reputation as a food lovers’ haven. Others built up the area’s recreational assets. Now, those passions bloom side by side, making Jewel Bay, Montana, a most unexpected place. It melds mouthwatering food, eye-watering art, a golf course designed by Jack Nicklaus, tummy-churning whitewater, and the most dedicated volunteer force on the planet. The result? A village chock-full of charm. Not to mention that it sits on a bay of the largest freshwater lake west of the Mississippi, with a backyard wilderness stretching more than a million acres, and Glacier National Park half an hour’s drive away. Since moving back home nine—nearly ten—months ago to take over the Merc, my family’s hundred-year-old grocery, I’d come to understand the power of local in a whole new light. My mother and I converted the Merc into a market specializing in foods grown or produced in the region. Wine to wash them down, pottery to serve them, and soap to wash up, all of it locally made, too. We also created a commercial kitchen in the back of the shop, so vendors can cook and pack their products in a facility that meets health department specs. But while I love my vendors dearly, it took about ten seconds to realize that knowing how to make fabulous pasta and pesto, cure award-winning salami, or cook huckleberry jam that makes grown cowboys tear up is a far cry from knowing how to market those skills. A whole ’nother kettle, as my grandfather Murphy would have said. So I’d put my decade of experience as a grocery buyer for SavClub, the international warehouse chain based in Seattle, to work mentoring my vendors in the fine arts of inventory control and cost management, giving an occasional lesson in sales and marketing. And after watching my sister, Chiara, launch a successful co-op gallery while other artists struggled to pay the bills, I firmly believe every working artist needs a crash course in business savvy.